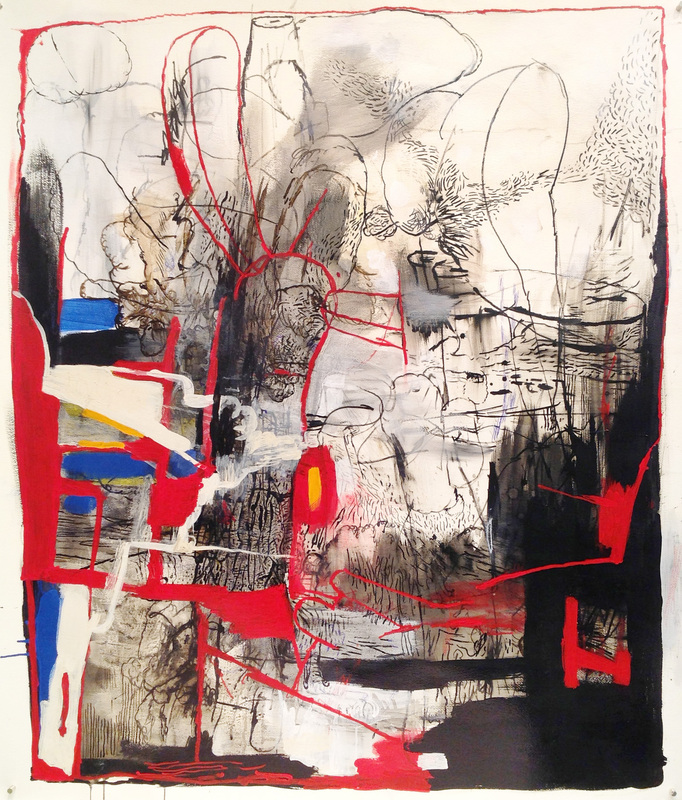 NUarts Gallery is excited to showcase for the month of July, “On Shaky Ground,” a show of paintings and drawings by NUarts artist Daniel Brody. Working in ink on paper and acrylic on canvas, Brody creates abstract works that explode and blossom with biomorphic shapes. In the energized paintings, a life emerges of parts and pieces, figures and landscapes, intermingled at odds and growing out of one another. “On Shaky Ground” is a sampling of works made in the last year that continues and deepens Brody’s exploration into this visual language of instability and transformation. Daniel Brody graduated from Cooper Union School of Art and has a professional career in architectural rendering. His paintings have been shown at The Hyde Collection in Glens Falls as part of the juried “Artists of the Mohawk Hudson Regional,” in a Solo show “Painting/Drawing” at the Berkshire Community College Intermodal Art Gallery, and as part of the three person show “Dreamscapes” at the Saratoga Arts Center. An opening reception, part of the citywide celebration First Fridays Artswalk, will be hosted by NUarts Gallery on, July 5, 5-8pm. NUarts Gallery is part of NUarts studios/gallery, currently housing 17 artists in varying disciplines. The NU Arts artists are Marguerite Bride, Dan Brody, Debbie Carter, Joanie Ciolfi, Diane Firtell, Kathy Gideon, Susan Himmel, Ellen Joffe-Halpern, Sophia D. Lee, Lisa Merullo, Dawn Metzer, Sam Ponder, Deborah Rufo Buratto, Harrison Searles, Sally Tiska-Rice, Eric Shuman, Claudia Shuster, Scott Taylor and Jesse Tobin. 02 Jul	This entry was written by nuartspittsfield and published on July 2, 2013 at 4:28 pm. It’s filed under exhibit and tagged abstract, art, brody, daniel, drawing, painting. Bookmark the permalink. Follow any comments here with the RSS feed for this post.